As technicians, there may be important information that should be familiarised when selecting suitable specialised tools and test equipment to be used on Petrol and Diesel vehicles. Diagnosing a possible suspected cause for a system fault is only part of a technician’s everyday task. The “Testing” and “Repairing” or “Replacing” of systems, circuits and components can be time-consuming procedures that may be “time reduced” when correct suitable test equipment and/or specialised tools are utilised. This not only allows the technician to quicken the task but also ensuring greater overall accuracy and reduced component damage. Note: Many of the specialised tools and equipment can be categorised as “must have” to allow the technician to perform their tasks accurately. Testing the operation of electronic throttle body on or off the vehicle. Driving the Throttle Body motor and monitoring the current draw required at the same time can quickly determine if the assembly requires replacement and allows for the throttle valve position sensors (TPS units) to be tested. (Excess current draw indicates – binding throttle valve operation or faulty motor). This may be a difficult and inaccurate task without the EQP-115. Note: Other system components such as Electronic EGR units or Variable speed cooling fans as well as in tank fuel pumps that are PWM driven can all be accurately tested by this piece of “must have” equipment. Testing the Common Rail Diesel Injector return flow to ensure all individual injectors generally function correctly. 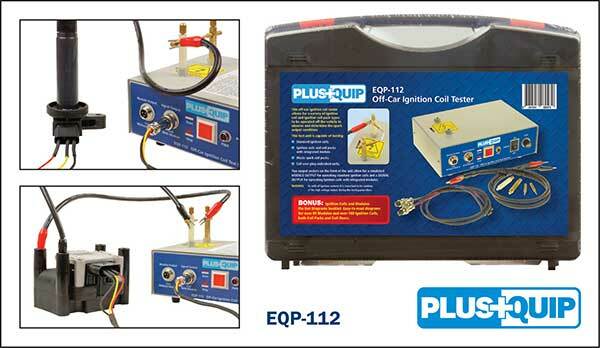 This again is a “must have” piece of test equipment for any workshops that may have customers with CRD vehicles. CRD injector return flow can be quickly tested by the EQP-107 by monitoring the return flow of each individual injector. Note: It is important to understand that return flow only occurs during the injector activated (switched on) stage. Any return flow occurring during the injector deactivated (switched off) stage indicates a faulty CRD injector. This generally can be felt as an engine misfire and monitored by excess return flow. Testing a variety of ignition coils (with or without integrated driver modules) on or off the vehicle. wasteful repair costs, making this another “must have “piece of test equipment. Testing both active and passive ABS wheel speed sensors quickly on the vehicle as well as testing the relative circuitry inside the ABS module. A suspected faulty active or passive wheel speed sensor can be quickly tested by connecting the EQP-111 and rotating the wheel. The related harness and ABS module circuit can also be tested by connecting the EQP-111 to the harness and monitoring the wheel speed sensor signal using the live data program on a suitable workshop scanner. Refitting new fuel hoses to in tank fuel pumps to reduce hose damage and minimise fuel leakage. 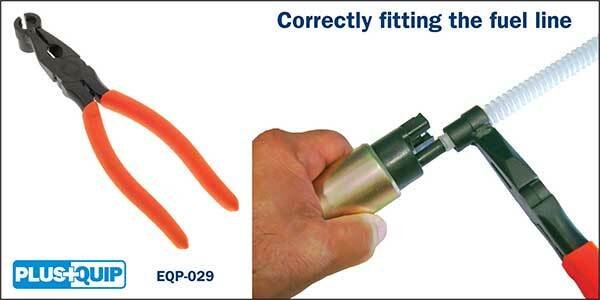 Refitting plastic fuel lines without correct tools may result in physical damage or fuel leaks. Removing the fuel pump assembly to repair created faults the second time is both time consuming and costly. There are of course many more specialised tools and equipment available (for repair and testing multiple automotive system tasks) that are listed in the Plus Quip range. With vehicles becoming more complex with increasing management systems, it is necessary to ensure that the technician has the correct equipment to quickly and accurately perform everyday tasks to ensure workshop viability. The Premier Auto Trade PlusQuip range offers quality workshop equipment suitable for the maintenance, testing, repairing and replacing of automotive components. The PlusQuip range includes products for the professional technician involved in the maintenance, diagnosis and service of vehicles and engine systems. For peace of mind all PlusQuip products come with a 12-month repair or replacement warranty and 12 months online technical support by industry experts.